Korean and Italian, contemporary and modern, old and new all meet at “Two Ethos,” a fashion collection that explores the combination of old Korean textiles and new Italian designs. “Two Ethos,” currently on display in Insa-dong, Seoul, combines two different identities which may not seem to have any relation to each other. 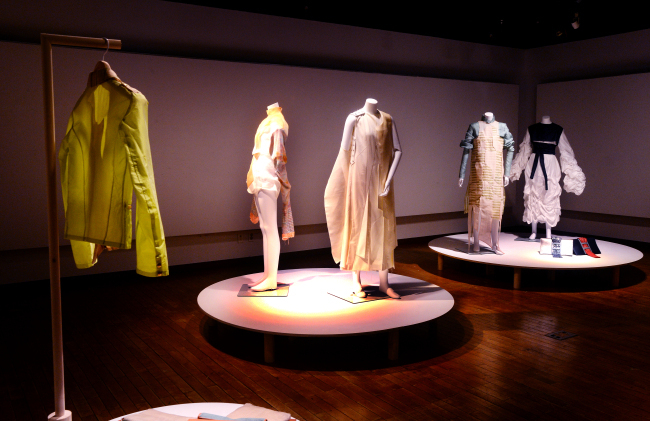 The project was a collaboration between students of Korea National University of Cultural Heritage in South Chungcheong Province, who created traditional textiles using ancient craft techniques, and students of Istituto Europeo di Design who gave life to the fabrics, creating contemporary outfits with Italian sensibilities. The results of the yearlong process offer a fresh take on how to use these age-old fabrics. “We usually have a ‘religious’ approach toward these kinds of fabric, they are precious and you don’t want to change them. People are afraid to renovate and build new relationships,” Art Director Giovanni Ottonello from the fashion school in Milan told The Korea Herald in an interview in Seoul on Wednesday. When he received the traditional fabric from Korea, he was filled with emotion, feeling the “passion and patience” of the creators. “In front of me was one or two months’ worth of work. The person who made the fabric, gifted it to me. (It was as if the creator was telling me) ‘Help me to use it in a different way,’” Ottonello said. He further explained that though Korean and Italian traditional fabrics are both made with silk, the two are very different in texture. While Italian fabrics opt for a more fluid, soft texture to create flow, Korean textiles are more rigid to form structured shapes. The project, consisting of five fashion collections and two accessories collections, was set around the idea of a “trip,” whether it’s a trip in one’s mind, or from Milan to Seoul. Mateo Crepaldi, one of the seven students who participated in the project, came up with the idea of a “futuristic woman” through his imagination of Seoul. He designed a top with the main body made using the traditional fabrics and knitted sleeves inspired by the shades of the fabrics. The long sleeves of the top stand for a connection between the future and the past. Recounting what it was like to see the finished piece on a mannequin, the student’s face was lit up with inexplicable happiness. “It wasn’t something I expected. The finished piece was so different from my sketch, in a good way,” he said. “Two Ethos” is on display at KCDF Gallery from 10 a.m. to 6 p.m. every day until May 28.